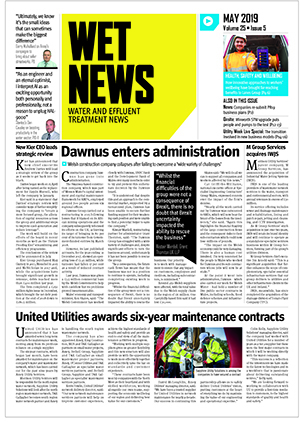 Monthly tabloid WET News is the voice of water industry contractors, delivering the specialist information that they require to operate efficiently, cost-effectively and profitably in an ever-changing market place. WET News recognises that these contractors are important buyers in the industry and, through its lively and authoritative editorial content, ensures they are up-to-date about the new products and services vital to their needs. The Leaders is our groundbreaking survey of the movers and shakers among leading water industry contractors. The annual guide is the only one of its kind to show how the top 30 civil and process engineering companies are faring in a very competitive market. Alliances highlights the leading partnerships carrying out capital investment programmes. It reveals which consortia are working for who, and the size of contract that are leading firms to join forces and spread the risk in a competitive market. Contractors, consultants, water companies and supply chain procurement managers will Alliances 2012 essential information.